Albert Robbins was Uncle Rob’s first cousin twice removed. 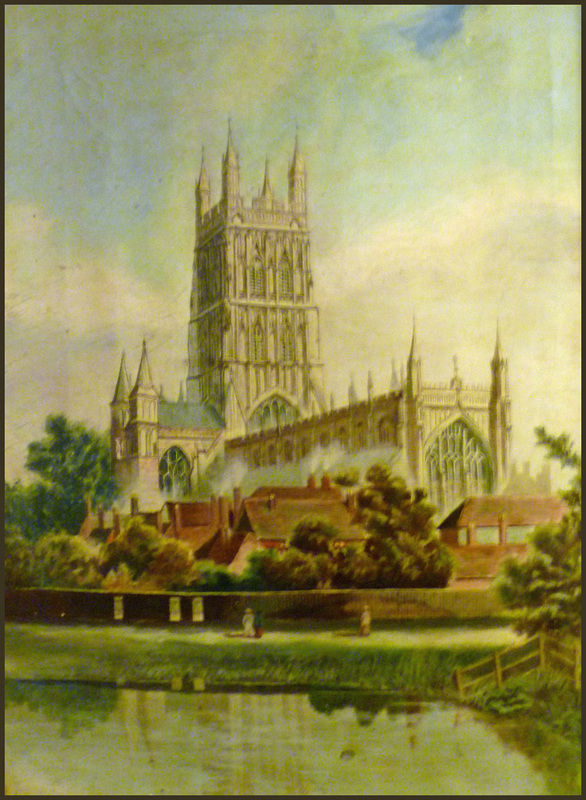 The painting shown here is of Worcester Cathedral and was completed in 1888. It measures about 12″ x 16″ and was accomplished in oils. Albert Robbins was a trained architect. “The subject was chosen . . . because the de Bordes had been living in Worcester around 1850, when the photo of Joseph was taken and our gt granmothers were young. He [gt uncle Bert] like my Gran was a first cousin of your gran Miriam, I imagine they would have known each other. Gt uncle Bert was in Mexico lookin for work in 1909, I have an interesting collection of post cards from him, sent back to my Gran and great aunt Nell telling the story of this trip. According to family notes written in 1990 by uncle Arnold (the 1900 baby), Gt uncle Bert who had been apprenticed with Rennie & Co ( where gt gt grandfather Joseph worked in the 1860’s ) Rennies were by this time Civil Engineers, Architects and Bridge Builders.